On Thursday (5 days ago) I forgot to take my morning meds. I was able to take most of them at night since none of them are duplicated except for the Uptravi… So I had to skip that one dose. My body FREAKED OUT when I took my next dose that evening. The next day was a horrible drastic return of all the side effects, just as bad as when I first started 1600mcg. The last few days have been almost unbearable. Plus really bad depression and anxiety — I don’t know if that’s because all of a sudden I’m physically miserable all the time again, or if there’s something else going on. Every day is slightly better than the day before, so I’ll catch back up to where I was eventually. Yesterday was only terrible between noon and 7:00pm, and at night, for a little while, I didn’t feel depressed. I think this one took me about a year. The last time I posted a new “Kayray Reads to You” recording was September 2015. Oof. It’s been a hard year. 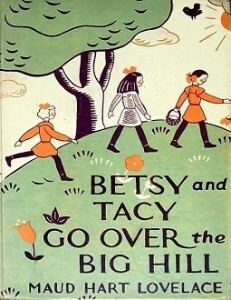 Betsy and Tacy Go Over the Big Hill: the third book in the Betsy-Tacy series by Maud Hart Lovelace. The series is based on the author’s life; her family and friends have been renamed, but they really were just like the the people in the books! In this book, Betsy, Tacy, and Tib all turn ten years old, and they’re obsessed with Kings and Queens. Ok guys, I’ll probably be feeling well enough to do some recording soon, knock on wood. I’m still working on Betsy-Tacy for “Kayray Reads to You” but I need to choose a new solo for LibriVox. I want to do a kids’ book. It must be in the Public Domain (published before 1923), beautifully written, and one I haven’t done yet — see http://kayray.org/my-recordings/. I’m thinking of A Wind in the Willows, but I haven’t quite decided. Any suggestions? No matter what I choose now, I’ll be glad to have a list for the future! Monday was my 4-weekiversary on 1600mcg of Upravi and the last two days were without headaches, nausea, or really bad pain. So that’s good! Lots of fatigue still, but that’ll probably get better in time too. I should have mentioned before that I jumped the gun on lowering my nighttime oxygen. 2 lpm was ok for a couple nights and then I was back to waking up gasping for air again, so I’m back to 3 lpm all night. But I don’t usually need it at all in the day unless I’m walking around!